Description: This document will walk us through the procedure of logging sensor data such as temperature, humidity, and water level to a MySQL Database on a VPS server. This data will then be displayed on a web page. Prerequisites: If you do not have a server already set up, you can use this page to set up a VPS server. Please follow the following link to set up the database on your server for this project. This database will be used to log data that can be displayed on your web page. We will just need a database and user set up with permissions. 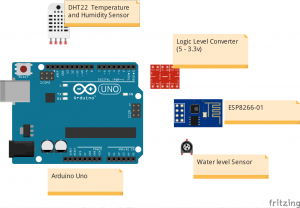 Also, we will assume that you have some basic knowledge of how to set up an Arduino project. Disclaimer: You are fully responsible for all safety and security. This information is provided “as-is” without any guarantee of any kind. If you find errors on this document, however, please let me know. I would like this information to be as accurate as possible. Step 1 — Gather your components. The DHT-22 will connect to Digital Pin 2, and the Analog level sensor’s signal will connect to Analog 0. TX and RX will go through the logic level converter, and TX on the Arduino will go to the RX on the ESP8266-01, and vice versa. You will need to supply 3.3v to the ESP8266-01 on it’s power pins, and the low voltage pins of the logic level converter. You can use the Arduino’s 5v to supply the sensors, and the high voltage pins of the logic level converter. Be sure to connect the ground of the 3.3v supply to the ground of the arduino. Do not use the 3.3v output of the arduino to power the ESP8266. You will need a separate source of power this. rate prototype board for ease of programming, making changes, and troubleshooting in the future. The arduino sketch will configure the SSID and password on the ESP8266-01 through the use of AT commands. This sketch will also gather data from the sensors and pass that data to the server. Since we are declaring the number of characters, and logging the data as Integer, I’m multiplying any floating point signal by 100, and adding 10000. The purpose of adding 10000 is to hold the number of characters constant while the data is transmitted, and this value will be subtracted once it gets to the server. Decimal data (x100) that gets logged to the database will later be divided by 100 before it is displayed to the user. There are other methods that you can choose to use to make this process a little more clean, but I’m using this method to keep the code itself fairly simple. Be sure to change your SSID, password, server IP address, etc before downloading. This is an example only, but if you have the database configured according to the link above, and make the necessary changes, everything should work fine. Also, be sure to set the baud rate according to the baud rate of your ESP8266-01 for serial. This example uses 115200, but some firmware uses 9600. This example is just modified from the DHT library example, and Analog Read Serial. While downloading, you might want to temporarily remove the TX and RX lines from the ESP8266-01 to avoid interference. Step 4 — Your Server’s PHP file for logging the data. 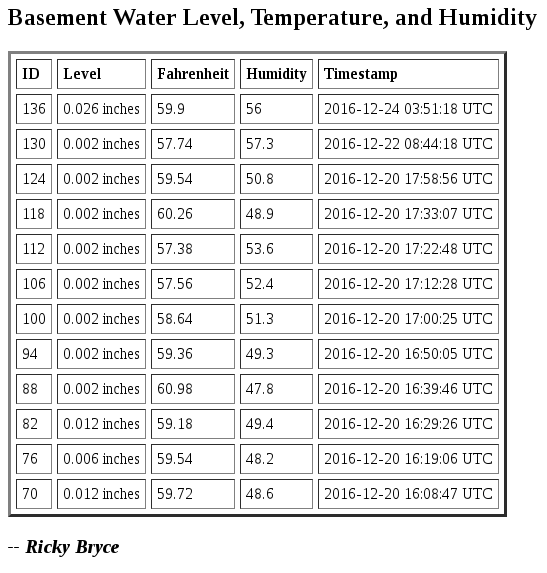 I’ve placed the following code in the server’s public_html directory as a file named basementlog.php This code will receive data from the arduino when it requests this page, condition the data, and log the data into the database. Be sure to adjust the database, user, and password as needed. // To send out an email, you must have POSTFIX or another sendmail type daemon installed. $headers = 'From: apache@irvingil.com' . "\r\n" . 'Reply-To: youremail@youremail.com . "\r\n" . Next, we will add a page that can be accessed directly by a web browser. We will place this code again in the public_html directory. The script can be accessed by a web browser by going to http://mysite/basementlevel.php You will need to modify the database information as needed. echo "&lt;tr&gt;&lt;td&gt;" . $row["id"] . "&lt;/td&gt;&lt;td&gt;" . $level . " inches&lt;/td&gt;"
."&lt;td&gt;" . $fahrenheit . "&lt;/td&gt;"
."&lt;td&gt;" . $humidity . "&lt;/td&gt;"
That’s it! Be sure your project is connected, and powered up…. You should be logging data. If you need to troubleshoot your project, you can manually enter the basementlog.php in your web browser, and pass variables onto the server in the URL. 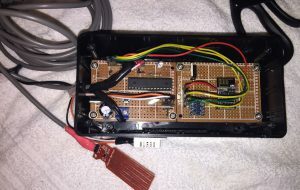 To troubleshoot your project, you can disconnect the ESP8266-01, and be sure the correct AT commands are being passed using your Serial Monitor in the Arduino IDE.